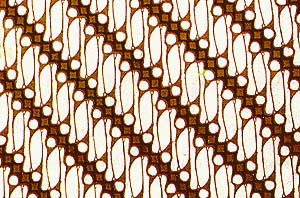 Parang Rusak (english: defective big knife) is a traditional batik pattern from Yogyakarta. It is visualized as many defective parang (big knife) with diagonally format. Yogyakarta batikers used to colorize it in brown & white.